I realized that basically what I had made was a laser sword, so I'm just gonna lean into it. It's a sleepy Monday morning and it's just close enough to noon now that I can justify brewing a second cup of coffee before I write this post. First, the flashy stuff. After implementing that laser sword, I got basic weapon switching up and running. Now I'm going through my list of weapon ideas and testing them out, seeing how they actually feel. I added an electric shock attack that zaps nearby objects and chains a few times. Pretty handy if you're getting swarmed. Then I thought, what if there were electric bullets too? So things got pretty fun. Second, I've mentioned the dialogue system, but I haven't talked about the narrative I'm planning. I want to keep it pretty light because the focus of this game is more action and exploration oriented, but I do want there to be a heart at the core of this experience. So I've been doodling a lot, getting feedback, and I'm getting pretty close to a style I'm happy with. Here's the most recent version of the pilot. Thank to those of you writing supportive comments. It's a little weird working on this solo, so your encouragement is appreciated! I like this a lot, intersting concept and nice visuals! Keep up the good work and find out where it takes you! this looks cool. were you influenced by the io games at all? I played agar and slither a bit, but they haven't really been in my mind while working on this. This kinda sprung from thinking about games like No Man's Sky and Elite: Dangerous, and loving that space setting but not necessarily the gameplay, and considering what I like about more traditional open world games and action RPG's, with a healthy dash of silly physics toy stuff. The result doesn't really play like any of its influences, which is why I like working on it. Here we are in the new year, 2018. No clue what the next twelve months have in store for me, but I'm ready to run in and punch each one right in the face. Come at me, 2018! Right out of the gate, I've been working on applying to show the game at a couple of conferences. I'll let you know how those pan out. In the meantime, check out this cool new trailer! Beyond that, there are some secret things in the works... more news on that when they're ready. I don't wanna jinx 'em. Here's something new I'm trying out. I recorded myself playing the game while talking about design stuff I'm working on and thinking about. Let me know if this kind of thing interests you. I've been working on the quest system recently, which has been a bit complex. It's my fault for wanting a pretty robust system to play with, but I think it will be worth it. More info on that as it progresses. I generally enjoyed the video devlog! when you were to concentrating too much on the playing game. although commented footage would require twice as much time to make. Thanks, Nikolas! I think I definitely got distracted by playing, but also my thinking tempo tends to run fast and then slow. I tried to edit around that a bit, but yeah. If I do a video dev log again, I'll probably do something much shorter and more prepared. There wasn't a lot of interest in this one, though, so I'll probably stick to text, gifs, and short videos to show off key features in the future. It's a rainy Friday evening, the weather's started to warm up bit, and I'm winding down after a pretty productive week. The quest system is coming along nicely! The game tracks objectives, rewards the player when they're accomplished, and will even automatically unlock and track the next task in a sequence. I threw together some simple UI stuff to tell the player when a quest is completed. Up until now, the UI has been fairly static, so I decided to write a nice script to handle complex tweening/easing. It really livens things up! I threw some temp art together for a weapon switching indicator, so that's nice to have. I'm getting close to reaching a good point with the quest system, and then I feel like it's time to really give the UI style some love. I've been working really hard on this one... and I'm finally ready to show character art. Meet the pilot, the CEO, the mechanic, and the pirate. This was quite a learning process for me, but I feel like I leveled up my art on this one. I'm excited to get these folks in the game and get some real dialogue written. Here's a few critiques about your character designs - Having a large set of eyes on a character's head is fine, given that the size of the head can accommodate them. Right now the eyeballs of your characters look like they're bulging out of their skulls, which makes them look less than human. I know you've probably heard this a lot so far in your artistic career, or you will, but draw from life. Practice anatomy too. The second character from the right's left shoulder should be higher as well. It doesn't match the height of her right shoulder. You can have your art style look any way you want, but if you're trying to pass a human off as a human, then they need to look human. I hope I didn't come off as too harsh or anything as it was not my intention. Best of luck in your future endeavors. The third character is a mechanic? Not a marine biologist? What's the story behind those tattoos? Thanks for the critique, Pixelologist! 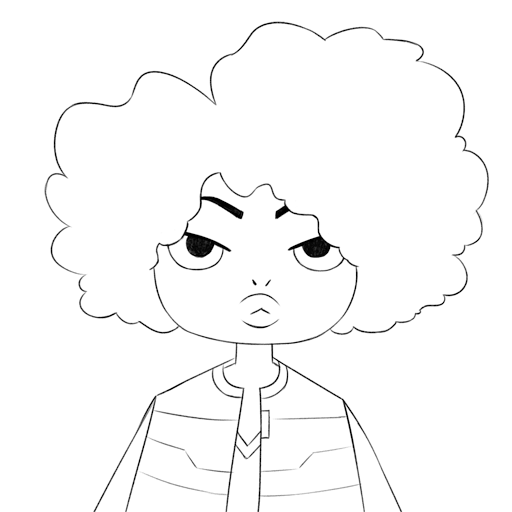 I usually have a kinda weird, cartoony style, but I think you're right, the eyes look a bit strange here. I'm definitely pushing myself outside my comfort zone, so it's helpful to get feedback on where I've stumbled. Also, yeah, it's hard not to come off as harsh online, but I've got fairly thick skin so no worries. I'll definitely be tweaking these later on. Lowbit, she's a total geek for sea creatures, and is inspired by marine biology in her designs. She's really more of an engineer than a mechanic, but that's also what you call the person who drives a train... so I haven't decided if that's confusing yet. Anyway, she'll be the one coming up with upgrades for the space train in the game. Thanks for taking the time to check out my stuff and give feedback, I really appreciate it! It's a link to a google image search for mechanical prosthesis design used in Deus Ex Mankind Divided. We will be showing Pan Galactic Railway at Bitsummit Vol.6 in Kyoto, May 12-13! This is my first time showing a game at something like this, so I'm a bit freaked out! But it should be fun. Updates will likely be sparse as I prepare, but I'll let you know how it goes. Has all this stuff you've shown done by only yourself? If so, you're practically a one man army! The game looks fun to play and looks beautiful to boot. Thanks, Jesse! Everything I've shown so far is stuff I did, with help from my wife Tina for writing and ideas. 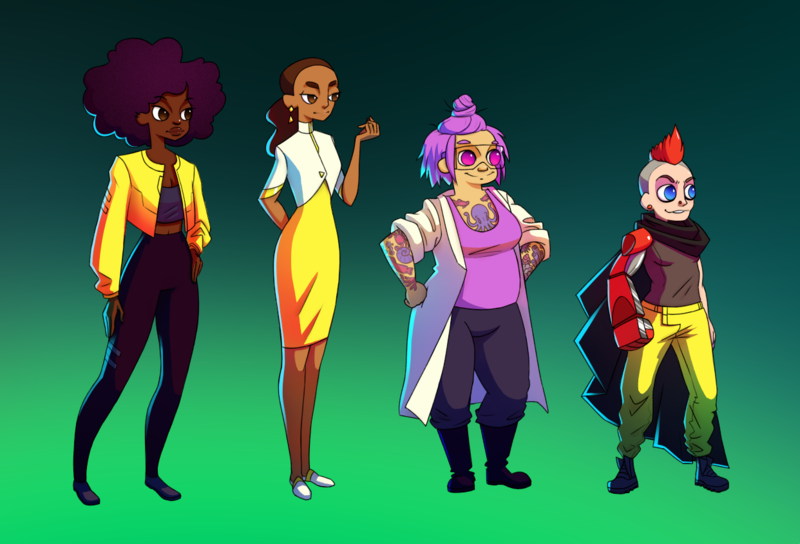 Ena Kim has done some character art that I'll be showing off soon once I'm happy with the interface I'm working on that includes it. She's amazing and I'm super excited about it!